Our “Ultra-Pure” water begins as abundant Hawaiian rainfall within an environmentally-pristine, virgin rain forest. It naturally filters through lava rock on a 25 year journey into our protected aquifer. From its early beginnings, Menehune Water has been dedicated to providing its customers with exceptionally pure water combined with a high level of service. 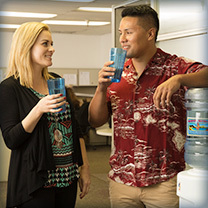 With a history of over 30 years of customer satisfaction, Menehune Water has evolved from being simply a local supplier in Honolulu to now serving Hawaii statewide, the U.S. Mainland and International markets. 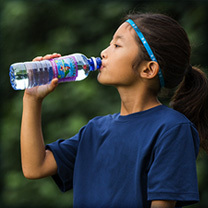 From its early beginnings, Menehune Water has been dedicated to protecting the environment with a recycling program that helps protect our exceptional water source. 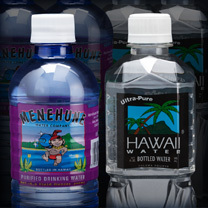 Menehune Water Co. is proud to be Hawaii’s largest bottled water company. Our founder and President, Ken Simon, established the company in 1985. From its early beginnings, Menehune Water has been dedicated to providing its customers with exceptionally pure water combined with a high level of service. As evidence of the company’s commitment to excellence, Menehune Water has received numerous awards including being selected several times as the State of Hawaii’s Small Business Exporter of the Year.